Scrivener already comes with great tools to develop a bare–bones scene, such as the notes panel, or the corkboard view. Even so, sometimes my brain turns to porridge and I feel unable to crank out a remotely acceptable opening paragraph. Enter Scapple. 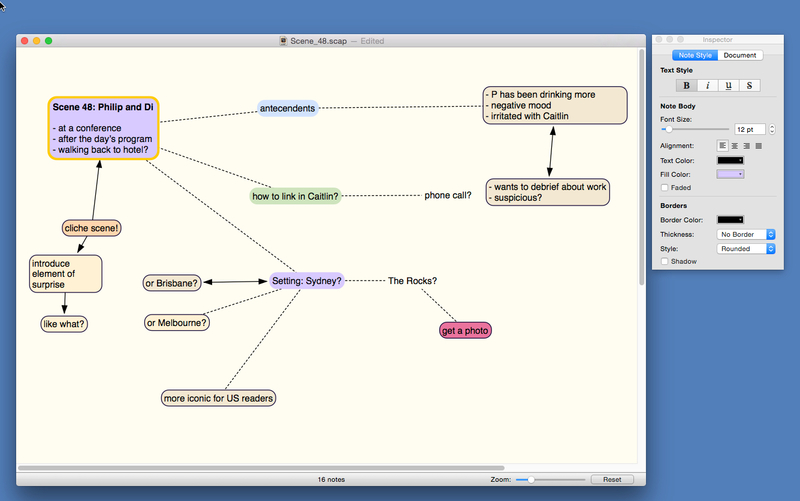 It is one of a number of apps that I use when I want a brief visual holiday from Scrivener. The others are iA Writer, Evernote (the web version in full page view) and OneNote. Among those, Scapple stands out because its ease of use, its light footprint, its reliability and its integration with Scrivener. Making a scene with Scapple. 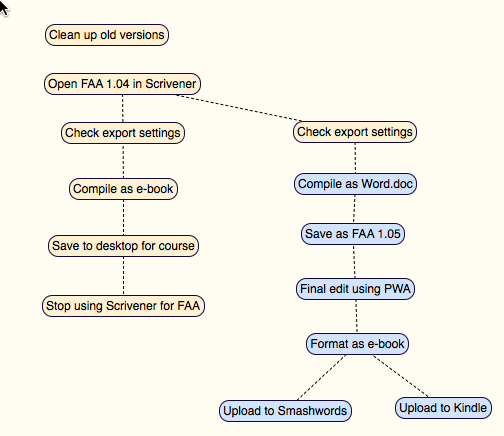 I am a very visual person and I like using Scrivener’s corkboard view for planning the content of chapters. I love it how you can drag the index cards around until the sequence of the scenes makes perfect sense. Scapple is more effective than the corkboard view, I find, in breaking down and rearranging the major components of a scene. I start by typing some questions about the scene: which characters appear? Who has the point of view? What happened when we last saw him or her? Where is the scene set? What needs to happen in this scene? What surprises could I throw in? You could save these recurrent questions as a template. I then answer those questions on the Scapple board in note form. I can easily move my notes around and group them. Clusters of ideas start to build up around certain nodes. Unproductive nodes may need to be ditched. Fleshing out a scene in Scapple often helps me realise that my storyline is too thin, that the point of view should reside with another character, that the scene should be split in two, or that its setting could be improved. You can connect your notes using drag and drop and the inspector lets you define a default style for colours and borders. You can also drag images into your Scapple board. Scapple is easy to use (learning curve of ~5–10 minutes) but rich in features (it comes with a 100–page manual). Drag Scapple into your Scrivener file. You can export Scapple files. Supported formats include PDF, PNG, RTF, plain text and outline markup. Syncing is through iCloud. There are no mobile apps. When I last checked, Scapple cost US$14.99. The app is available for both Mac and Windows. I am running it on Yosemite (it requires Snow Leopard or greater). Check out Scapple’s features in more detail on the Literature and Latte website if you’re interested, or give the free trial a go. This entry was posted in writing: apps and tagged novel writing, scapple, scrivener by Gilbert Van Hoeydonck. Bookmark the permalink.